I guess I am the first to post this. I read EP2 as someone that likes to call a lot, and limps in a lot, almost never raising. I have encountered some of these type players at tables. hence I have his range for raising as tight. we 3! to $70in MP2. I wish we had more info on how we had been acting at the table, how long we had been playing, our image etc. EP2 checks, we bet $70, and they min-raise us to $150. what does EP2 do with the following? Top pair: since he has a history of calling, I would expect a call. would raise some of the time. Honestly, I am folding right here unless I have seen him donk around or get aggressive with draws. If he is that bad (calling station) we can find a way better spot, and he will go broke soon enough. The rule with calling stations is never to pay them off when they start getting aggressive, which is exactly what we do in this hand. Turn is the , it is checked to us, and we bet $250. If I believed he had flushes in his range that didn't contain the I would bet here as we did, otherwise I am checking behind. To me its the same, he didn't remove anything by checking. maybe QQ and 88, so sets are not a part anymore. We get check/raised all-in on turn. Did anyone come up with anything different? Would EP2 fold, call or 4bet w/..
AK? Call. He's been described as a fold hater and call lover to the point of enjoyment. The image I have of EP2 Terrible is that of a massive station not really a "spewy" overly aggressive laggy splashy punter type. Just likes calling and to see what happens. Not thinking about ranges that much. Just wants to draw out and irritate tags type of guy. JJ? Call. Same deal. I view this player type as the type to look down at pocket JJ and decide it's right on the cusp of 4bet vs. call and since he's not been described making any aggressive plays other than this first open within the last 30 minutes then I'd be more inclined to think he'd call 3bet here. 22? Call. Again I'm going w/ my original position that this is the type of player that's loose, having good time and enjoying making bad calls postflop and likely finding it amusing when he draws out on the tighter aggressive players. EP2 more likely to C-C or C-R w/..
TP? C-R. These are the first aggressive actions villain is taking and it makes sense to me that if he'd prefer to call 3bet w/ a hand like AK, then I'd say he'd do the same w/ AQ, KQ, etc. I don't believe he's doing it with KK+ however as I think he'd have 4bet those pre. QQ is possible maybe half the time, but since he's on the looser side of the spectrum I think it's actually more likely he 4bets QQ pf as well. Flush Draws? C-C. I don't think he's the type of player to aggressively C-R bare flush draws, at least there has been no evidence giving me reason to believe that he would. However, I do think he's capable of raising TP+draw hands like AhQh, KhQh etc. Draws? Yes. specifically the TP+flushdraw hands like AhQh, KhQh. 2pair or better? Yes. I think EP2 terrible is certainly capable of taking the same line as flop and I think when this particular player does C-R both flop and turn w/ no previous evidence of aggressive actions that he's doing it for value a high percentage of the time. Rarely if at all would he be bluffing. Would you call this all in as played? No. I'd need about 47.7% equity and barely any at all on this board vs. his range at 4.11%. Also from all info gathered we can infer that this player has at least TP or better a high percentage of the time. I pretty much agree with the original poster. I do think this player would 4 bet with AA and KK though. On the flop, I didn't see him ever check-raising with air. 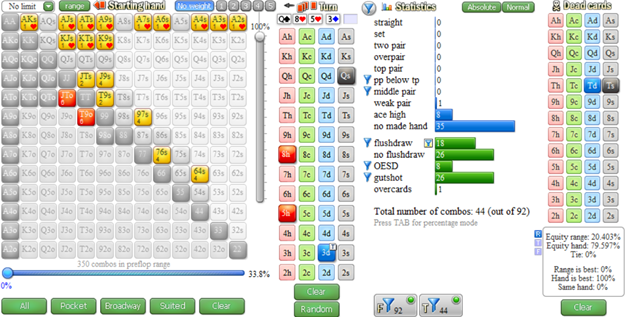 I think he's going to have top pairs, sets, flush draws (which should all be quite strong), and pair + flush draws (Qh). On the turn, when this player checks, I definitely didn't discount any strong hands. For some reason, I had a thought in my head that this player was attempting a double-check raise maneuver. Not sure why since I really don't have information to suggest that they may try this. Personally, I'm not betting TT here since my opponent has such a strong range. Best case scenario is that he does only have a flush draw and I get some value from those hands. However, he definitely isn't folding a better hand, and most of his flush draws still contain cards that can beat my TT. I think I'd be trying to get to showdown here since if I do get raised on the turn, I'll be in a very tough spot and marginal spot and simply have to fold. One thing I think was worth thinking about more is that the notes say that this player hasn't open limped much. So, perhaps his opening range is a little bit wider than I'm using. However, I think the wider range only gives him a few more flush draws, open-enders, and gut shot hands, and most of these extra hands don't take the action he made on the flop, which brings me back to the same ranges used by original poster beyond the flop. 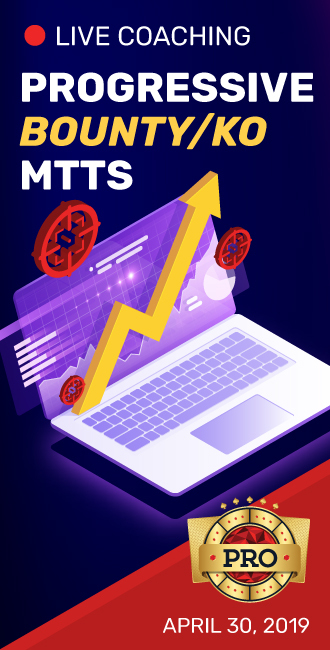 4 folds and EP2 calls $50 more. You bet $250 and EP2 goes all-in. This check-raise caught me off guard. I thought he would have bet his sets and top pairs. 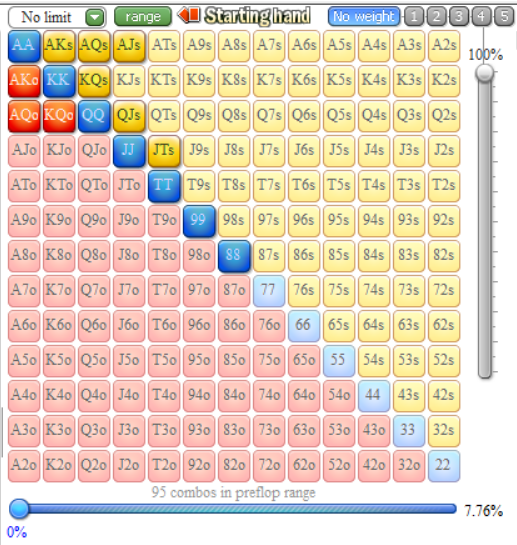 Would you call this all-in as played? No, as usual, I credit the villain with a very strong range and I don't think there is enough air in his range to call here. My definition of a "terrible" player is someone who is very loose and aggressive. Sometimes I find this type of player in my live $2-$5 NL game. I would expect Villain to check-raise with a set, this is because terrible players want to build the pot with his monster hands and draws. Based on the range assigned to villain, I would call the all-in raise on the turn. Preflop: Terrible in the EP2 opens for $20 and I 3B to $70 in MP2. Terrible shows new behavior that I attribute to a made hand but not a monster perhaps JJ. His range is 10% (120 combos) JJ-88,AKo-ATo,KQo-KJo,AKs-ATs,KQs-KJs,QJs,JTs,T9s,98s,87s. 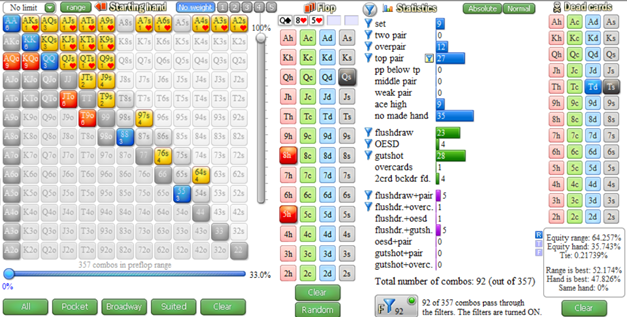 The terrible EP2 calls so I take AK out of his range 9% (113 combos) QQ-88,AQo-ATo,KQo-KJo,AQs-ATs,KQs-KJs,QJs,JTs,T9s,98s,87s. Folds all around. They would have 4B Ak, check JJ and never had 22. EP2 with a pot sized bet of $150. 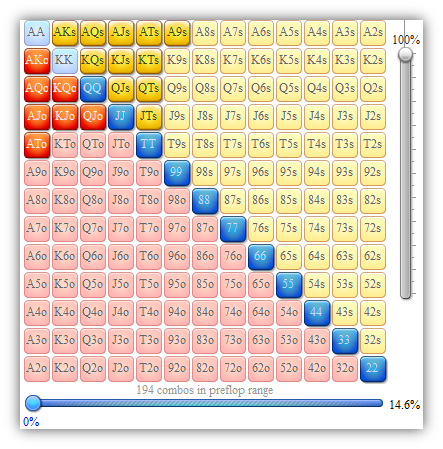 Ep2 is betting with top pair and flush draws but not Air. 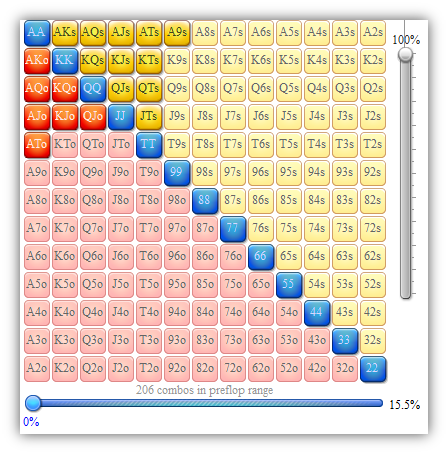 His range continues with 40% of previous (38 combos) QQ,88,AQo,KQo,AQs,KQs,QJs,AhJh,AhTh,KhJh,JhTh,Th9h. I would expect EP2 to barrel with top pair but not draws or Air. EP2 is on a flush draw and if lucky, he has a gut shot with that flush draw. EP2 may have checked with sets. 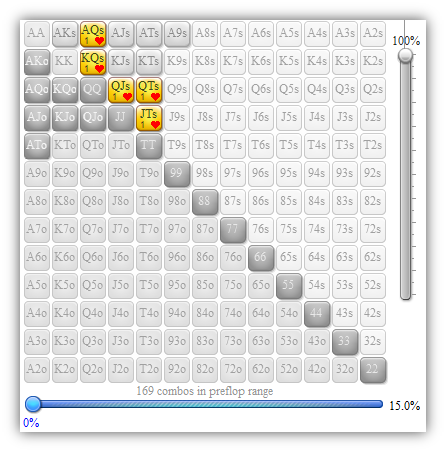 He continues with 100% of previous (38 combos). I bet $250. Terrible EP2 shoves al in so I conclude he is on a flush draw but has queens or sets but not two pairs. Half of his openrange is Ax. 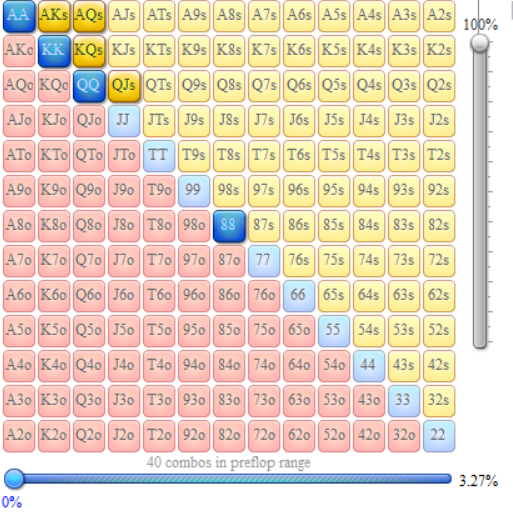 155 combo's = 75% of his openraise-range. 2Pair is not in his range. I don't think that a callingstation will x/r air, so I eliminate air-combo's. He checks. I think he would barrel his sets. So I eliminate 88. I think he would barrel his TP and FDs quite often, so I put a filter 50%. Villain x/raises all-in. His stack was about the size of the pot. Flopzilla gives my hand 12% equity versus this range. So I fold. $2/$5. EP2 has been very active over the last 30 minutes. 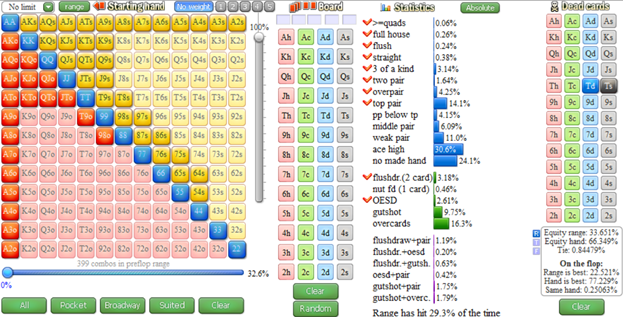 They seem to hate folding preflop and enjoy making weak postflop calls. EP2 opens to $20 folds to Hero in MP2 w/ TdTs, we 3Bet to $70, folds back to EP2 whom calls. I believe I play with players like this. 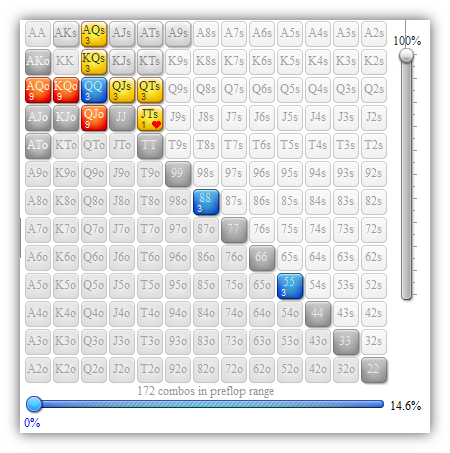 They start the game immediately on TILT, ready to gamble and be aggressive. VERY Wide Range. Doesn't like to fold preflop and doesn't fold much to aggression postflop. Will fight back with aggression and play draws fast. I leave his open and calling 3Bet range the same, since it's Heads Up, he wouldn't want to play KK fast and possibly be up against AA or He'll play AA slow, hoping to trap. As I analyze this hand, I realize I may be giving him to much credit, but here's my reasoning, however off they are. We called the flop CR. EP2 checks again and we bet $250 and again he CR ALL-IN. This is very aggressive play and somewhat unorthodox. Since he showed aggression on the flop, I'd assume he would continue telling his story that he has a strong made hand or strong draw with a bet on the turn. With another CR on the turn, Alarm bells are going off, but I just don't think he's that strong. Why risk giving us a free card? I truly feel this is him play a draw very aggressively. I'll risk going broke for this information. It says EP2 has been active over the last 30 minutes, doesn't like folding preflop. I don't understand why everyone would have pocket AA or KK in his range. Even bad players know to raise those hands and not limp in. If we have him flatting big hands pre and check raising many top pairs, he has 72% equity on the flop. Even removing the overpairs and top pairs from his check raise range and adding in all of his gutshots, he's still 53%! Seems an easy fold on the flop unless we give him a ton of low equity bluffs. Then we get to the turn and we bet? No clue here. I would take the free river and reevaluate. Then he shoves and we have to decide whether to call it off? We've butchered the hand this far...why fold now? !